The 120 degree built-in wireless license plate backup camera works with our built-in wireless monitors. Please call for compatibility. The Digital Wireless License plate backup camera has a wireless range of 125ft, it is the longest range in its class. Featuring full color and It has progressive night vision. 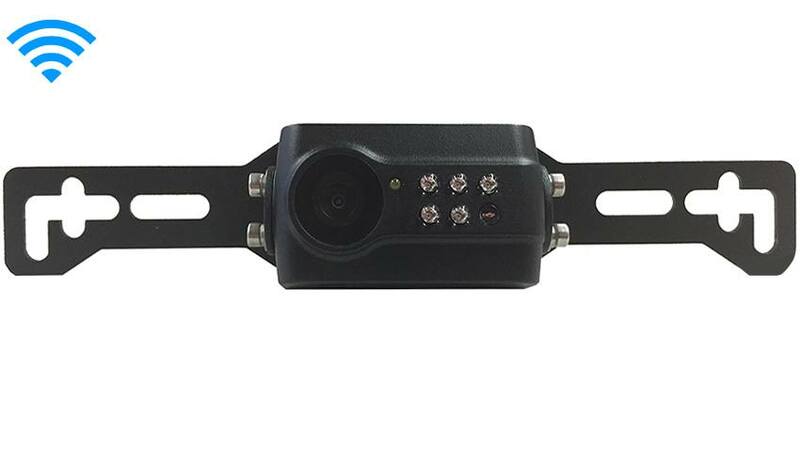 This camera can double as an observation backup camera which means it can be left on continuously active while you are driving down the road and changing lanes. The lens on this camera is hi resolution and can be upgraded to have enhanced night vision, it can also be upgraded to a wide-angle view of 170 degrees (from 120) with moving grid lines. All customization can be done by using the “customize and upgrade” section at the top of the page. You can make this a full system by adding a monitor, click on the “Customize and Upgrade” section at the top of the page. bundle featuring a monitor and multiple rear view cameras. that page to make the multi camera system that fits your needs. If you are in the market for a quality wireless Slip On plate backup camera, TadiBrothers has you covered. Our years of expertise, quality products, and low prices are why informed shoppers choose us for their vehicle camera needs. We provide you with 24/7 tech support, and our knowledgeable staff is always willing to help with any questions you may have. Call us anytime at (866) 966-5550, or simply place your order online. Our secure website makes buying the camera products that you need convenient and safe. Buy a wireless Slip On plate backup camera today and prevent an accident tomorrow! Looking for a complete Digital License plate backup camera kit? Click here for more options.